John Pilger's latest documentary, Utopia, which details the abuse and discrimination Aboriginal people still experience, is distressing to watch. Feelings of anger and shame rarely left me on this journey into 21st Century Australia where wealth, privilege and power ignore and perpetuate crimes against Aborigines. Historic footage makes this story even more shameful. An Aboriginal woman interviewed in 1962 states, "They forget we are human". Not much has changed. The film opens with the late Lang Hancock, the Western Australian mining magnate and father of Gina Rinehart, in a television interview. He argues why Aboriginal people who "are no good to themselves" should be sterilised. The irony of the film's title Utopia becomes apparent when Pilger takes us to the remote region north of Alice Springs which carries that name. A doctor working in Utopia describes the appalling housing and lack of basic health services that most Australians receive and expect. He details how he has seen cockroaches in the ears of some Aboriginal children and adults, who experience disease eradicated in many low income countries. It is appalling and disgraceful that there are communities in Australia with no electricity, and homes with no kitchen or shower, and running water only from one outside tap. Two of the chilling interviews Pilger puts to air are with former Labor ministers who held portfolios where they had the power to make a difference. Warren Snowden, the former federal Minister for Indigenous Health and an MP for the Northern Territory for 23 years, blusters his way through one of the sadder moments in the film, when he responds to Pilger describing the night he was in an Aboriginal community and a relatively young man, Davey, died of rheumatic heart condition. We also hear about the shocking death of Ian Ward, an Aboriginal elder who "cooked to death" in a WA prison van, driven by private contractors, when the temperature reached 56 degrees celsius. We learn that there are now 14 adult prisons in WA. The latest to be built will be an Aboriginal-only prison. Margaret Quirk, the WA Minister for Corrective Services when this occurred, explains to Pilger the then Labor government's policy of "racking and stacking" or "warehousing" — a sickening response to the record numbers of Aboriginal people who are jailed. My feelings of shame largely came from the fact that there seems to be no end to the abuse inflicted on Aborigines and from the collective failure of Australians to acknowledge and compensate for these crimes. Pilger takes us to Rottnest Island off the WA coast with two local Aborigines, the site of a concentration camp for local Aborigines that has been converted into $200-a-night accommodation. These rooms look out on a yard were Aboriginal prisoners were forced to build a gallows. Inmates, some of them young boys, were forced to witness the hanging deaths of 51 of their fellow prisoners. Pilger has done outstanding work in producing Utopia. Many Australians are unaware of this ugly side of our history that continues today. 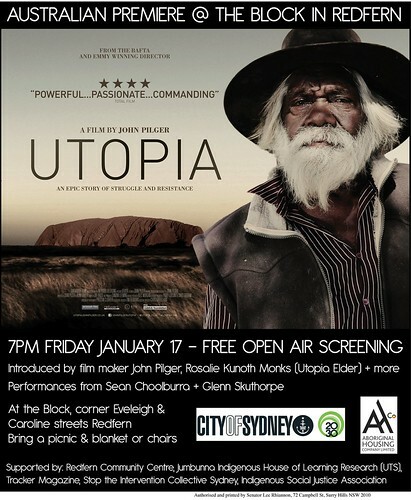 Utopia will be screening at The Block in Redfern on Friday night, 7pm.